Nearly all crab legs sold are only available frozen. The crabs, whether Alaskan king crab, snow or blue crab, were flash frozen soon after they were caught. 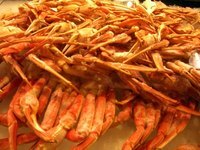 Since the crab meat starts to spoil as soon as the crab dies, crab legs are not sold fresh. Occasionally you will find live crabs for sale or freshly defrosted crab legs at the grocer's or fish store. Crabs have a naturally sweet ocean-fresh flavor. Excess salt is usually not a problem but is easily removed. Remove the crab legs from their packaging. Place in a colander. Put the colander under cold running water until the crab legs have defrosted. The water running over the crab legs should dissolve any excess salt and carry it away. Crack open a leg with a nutcracker and taste the meat to see if it's still too salty. If so, put the legs in a bowl of cold water. Change the water after 10 minutes. If the legs are still too salty, crack open all the legs. Remove the meat with a pick. Place the meat in a colander and place under cold running water for a few minutes. Drain well and pat dry before serving or using in a recipe. Like other ocean shellfish, crabs are naturally a bit salty. It's not possible to remove all the salt without destroying the flavor of the crab.